Hybrid City is an international biennial event dedicated to exploring the emergent character of the city and the potential transformative shift of the urban condition, as a result of ongoing developments in information and communication technologies (ICTs) and of their integration in the urban physical context. After the successful homonymous symposium in 2011, the second edition of Hybrid City has grown into a peer reviewed conference, aiming to promote dialogue and knowledge exchange among experts drawn from academia, as well as artists, designers, researchers, advocates, stakeholders and decision makers, actively involved in addressing questions on the nature of the technologically mediated urban activity and experience. 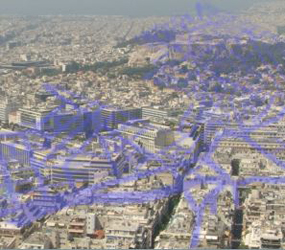 Hybrid City Conference 2013, in Athens, Greece, will consist of three days of paper presentations, discussions, workshops and satellite events, under the theme Subtle rEvolutions. The events will be hosted by the faculty of Communication and Media Studies, of the University of Athens and are in particular organized by the University Research Institute of Applied Communication (URIAC), in collaboration with the New Technologies Laboratory of the faculty. The main venue of the conference is the central, historic building of the University of Athens, while workshops, projects’ presentations and parallel events will take place in collaborating centers and institutions in the center of Athens. The “Hybrid City” events are realized in the context of the “City is a Hybrid Interface – HYBRI-C” project of the EACEA Culture programme 2007-2013. ICTs, whether mobile, wireless or embedded in persistent architectural forms, facilitate the collection and dissemination of data, infusing the physical expression of the city with digital layers of content, contributing thus to the emergence of new hybridized spatial logics and novel forms of social interaction. These systems and the hybrid spatial experience they afford, encourage encounters among users; both embodied and mediated, and influence community dynamics, giving rise to networks around common interests and collectives of affect. Sometimes, such groups, irrespective of how ephemeral, unstable and dispersed they may be, negotiate a new kind of engagement with the urban environment and civic life, suggesting thus an organizational paradigm that manages to surpass traditional vertical hierarchies of space and consequently of power and control. Such configurations among communities, locations, contexts and intentions were manifested intensely in the interlinking of protest events around the world since 2011, the Arab Spring uprisings, the Occupy movement and anti-austerity demonstrations in Southern Europe, but they also gradually permeate everyday life in the contemporary metropolis. • Open cities, open urban data. • Environmental sensing and the Internet of things. • Environmental perception, cognition, immersion and presence in the context of hybrid urban spaces. • Citizen science and peer production of knowledge. • Psychosocial perspectives into the impact of locative and pervasive media use. • Placemaking, place attachment and place identity in the hybrid city. • Cartography of hybrid spaces. • Mobile commons and wireless practices. • Public spaces and mediated presence. • Gamifying the urban space: playful engagement and game-like citizenship. • Hybrid spaces of conflict: forms of power and counterpower in the networked city. • Tactical media practices in the urban context. • From open data to data commons. • Open source models of policy and governance. • Emerging currencies and values. • Issues of data ownership and copyrights in hybrid urban contexts. • Steve Benford, Professor of Collaborative Computing and Head of the School of Computer Science at The University of Nottingham, member of the Mixed Reality Laboratory and of Horizon, author of ‘Performing Mixed Reality’ (with Gabriella Giannachi), MIT Press. • Eric Kluitenberg, independent theorist and writer on culture, media, and technology, editor in chief of Tactical Media Files, an online documentation resource of Tactical Media practices worldwide. All accepted papers will be included in the printed conference proceedings and provided to conference attendants. * Extended abstract of 1000 words max. * Biographical statement of no more than 250 words. Submissions should be in a Word or PDF format and not exceed 10 Mb in size. Please upload submitted files at: http://uranus.media.uoa.gr/hc2/. All abstracts will be peer reviewed. Authors of accepted abstracts will be notified before the 20th of December 2012. Final submission of full papers will be expected no later than the 20th of February 2013. Deadline of Abstract Submission: 20 October 2012. Notification of Acceptance: 20 December 2012. Deadline of Full Paper Submission: 20 February 2013. Conference Dates: 23-25 May 2013.